A few years ago, I picked up a somewhat pricey Argentine Cabernet Sauvignon out of nostalgia for South America. When we poured the wine at our family holiday party, we were impressed by the quality of the wine and its delicious flavor. 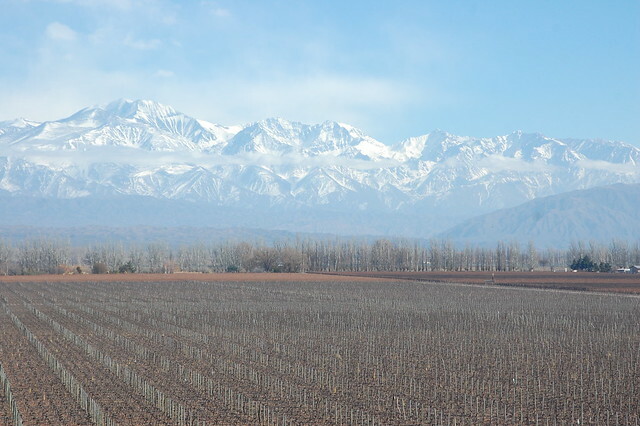 Since then, it has become a family tradition to buy a Catena Malbec or Cabernet Sauvignon each year to celebrate being together at the holidays. 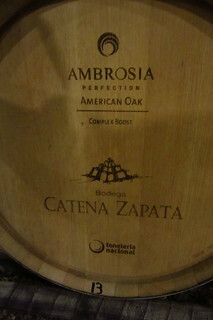 This is how Bodega Catena Zapata became my favorite winemaker. 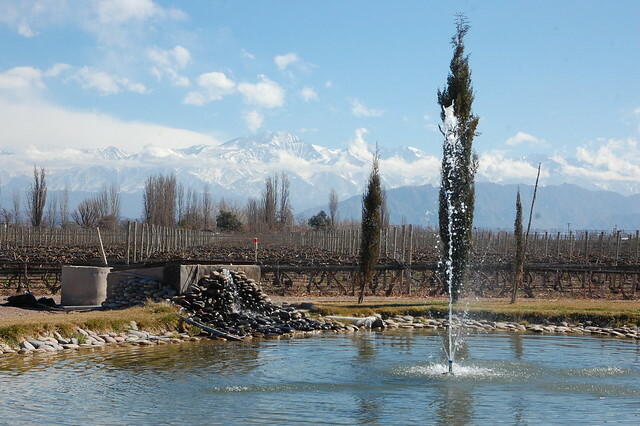 When I decided to return to Argentina, I knew I would visit the winery and taste the wines right where they came from. 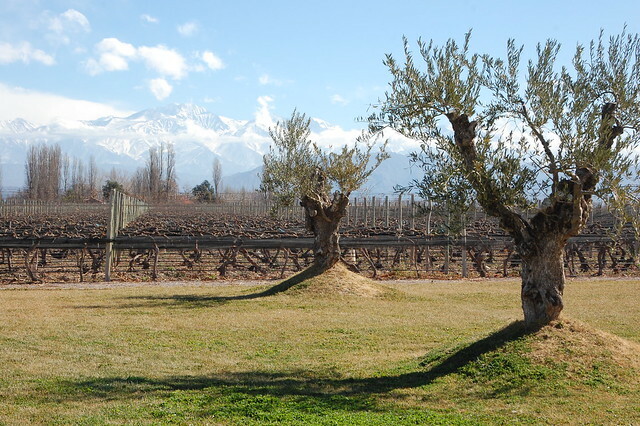 At first, it seemed challenging to get out to the winery on my limited budget, as it is located in Luján de Cuyo, but far from the town center. However, I’d asked one of the guides in Chacras de Coria for advice, and he’d told me that it was totally possible to get out there using a combination of public transportation and taxis. As you can imagine, I was not, in fact, on the right bus. However, I was at least heading in the right direction. As we approached Chacras de Coria, I recognized the town center and asked the bus driver once again if the bus would finish its route at the main terminal of Luján de Cuyo. A little sheepish, he finally informed me that this bus did not go to the main station. As it turned out I was not alone; there were two other people who had also taken the wrong bus, and he dropped us off at a bus stop in Chacras with some vague instructions as to what bus to wait for. At this point, it was getting very close to my scheduled 11AM tour, and I nervous I would miss my chance to visit Bodega Catena Zapata. I had no way to call the winery to tell them I was running late. I knew I needed to somehow find a taxi to take me out to Bodega Catena Zapata. As I was waiting to ask the clerk a corner store for advice, I spotted a taxi passing by and flagged it down. I told him where I wanted to go, and he agreed to take me out there, warning me that it would be an expensive fare! At this point, money was no object and I just wanted to get there; we agreed that it was complete luck that he’d been passing through Chacras de Coria, as it is not a place where you usually can easily find a taxi. 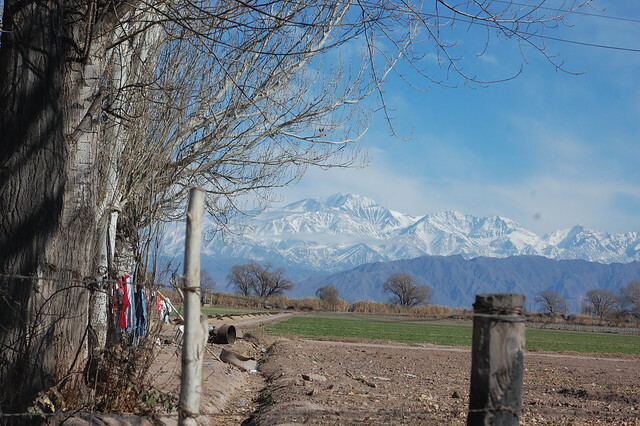 Finally, I was on my way again and I was able to relax and enjoy the ride, astounded by the appearance of the snow-capped Andes along the route. As it turned out, the taxi cost $130 Argentine pesos, or about $23 USD, which was not too bad. And in another stroke of good luck, even though I arrived about 25 minutes late, so had my tour companions, a couple from Brazil. They’d gotten a bit lost driving through the back roads of Luján de Cuyo and had only been waiting for five minutes before I got there. Our guide was a trilingual Argentine who spoke Spanish, English, and Portuguese fluently; you could tell she was very highly educated and well versed in the field of wine. We were in for an excellent tour, conducted in a combination of Spanish, English, and Portuguese, as each of us had different linguistic strengths. 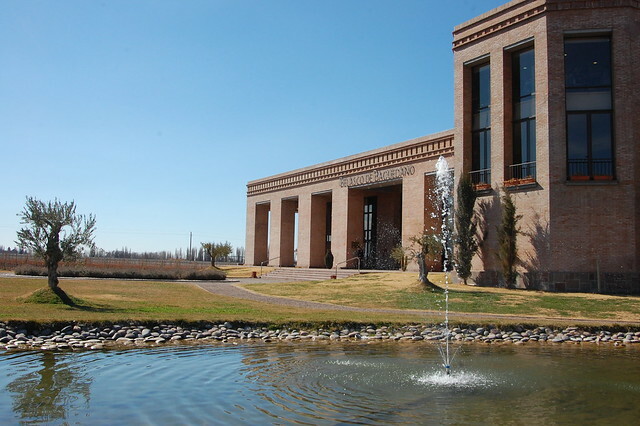 Bodega Catena Zapata is a historical winery often credited with putting the Mendoza winemaking region on the map. 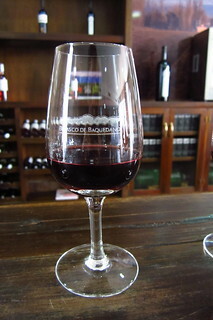 While Argentines have always had a strong affinity for wines, local wines used to be imbibed for their intoxicating properties, not for their complexity of flavors. When Nicolás Catena and his daughter Laura took over the family business, they brought with them experience from the Napa and Sonoma regions of California and a strong desire to produce high quality wines. 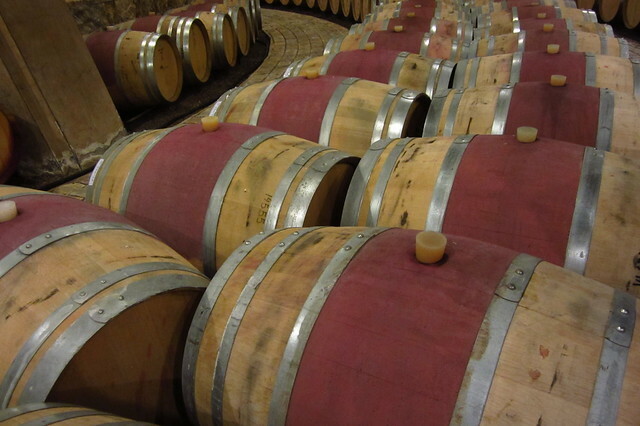 As we toured the winery, our guide explained the intricacies of the Catena Zapata method, including using both American and French barrels and producing several different lines for both the Argentine and international markets, tailored to the tastes and preferences of their consumers. 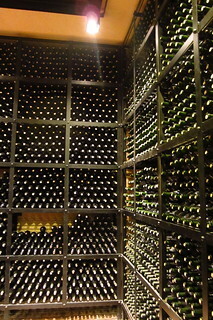 The bottle pictured above is one of the most valued wines in their wine vault, as it is a particularly special vintage from one of their highest quality lines. After touring the winery, we climbed to the top of the building to look out over the vineyards, which stretched out for acres. Can you imagine how gorgeous this would be during growing season, with green leaves everywhere, protecting the amazing fruit? Afterwards, we sat down in a comfortable lounge area for our premium tasting. Our talented guide explained the guidelines for appropriate tasting to us in great detail, encouraging us to observe the color of the wine, showing us how to smell it, and helping us distinguish differences between the first and second sip. Beyond the educational opportunity, I was so excited to try wines I could never afford to purchase back home. 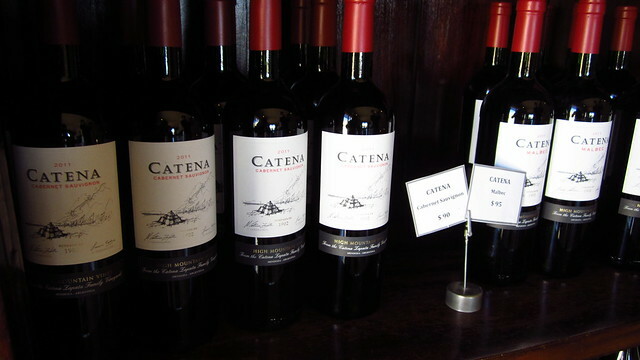 Afterwards, we headed to the gift store, where you could see all the different brands produced by Catena. 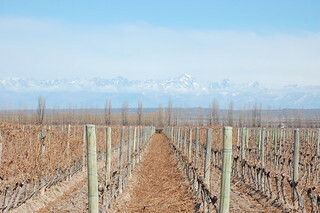 The store sells both the wines produced for the Argentine palate and those sold abroad. 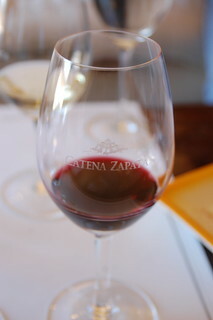 I had actually not been able to find Catena Zapata wines in Mendoza because they are sold under a different label. Above are the entry-level wines which are most commonly available in the United States. 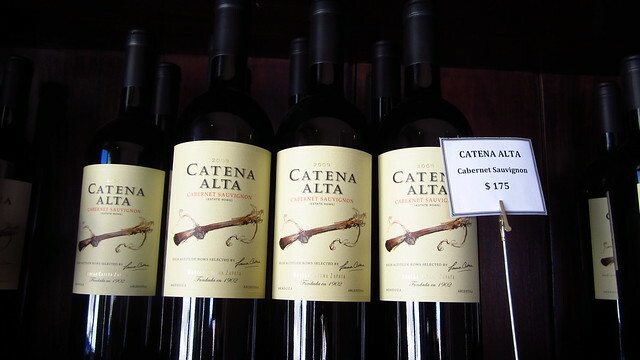 This wine, Catena Alta, is the next level of the international wines, a step above the Catena line. I really enjoyed these wines in the tasting and was so tempted to buy a bottle, but I was worried it wouldn’t survive my bus journey the next day. Instead, I left with a Catena Zapata bottle opener as a souvenir of the experience. My Brazilian companions had kindly offered to drive me to my next stop, Belasco de Baquedano, which was just down the road but not really the walkable distance I’d been told. While they purchased lots of wine glasses and bottle to take back to Brazil, I wandered around taking pictures of the vineyard. My new Brazilian friends took me back along Cobos to Belasco de Baquedano, chatting with me all the way in a combination of Portuguese and English. We talked about having dinner together back in Mendoza, but didn’t manage to touch base again. I arrived to Belasco de Baquedano just before my 2PM tour and tasting, and they asked me to wait a few minutes. I went outside to explore the grounds and take in the vineyards. This also gave me a chance to have a snack in the sunshine; I’d brought along a picnic lunch. Belasco de Baquedano actually has a fine dining restaurant on site, but I hadn’t been able to find any information on whether they offer a vegetarian option; as it turns out, they do – I know for next time! Belasco de Baquedano shares the same gorgeous view of this corridor of the Andes. 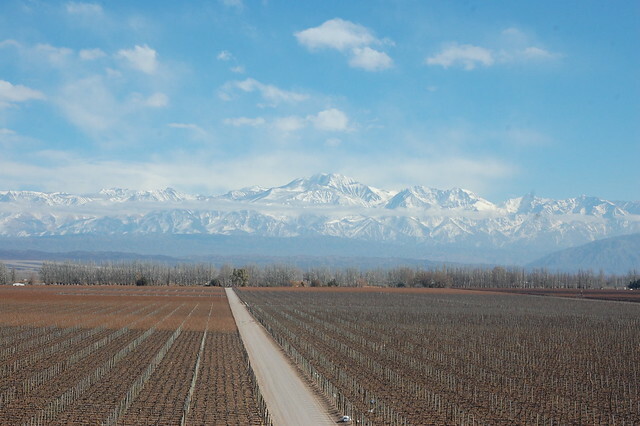 While there are lots of vineyards around this area, few people actually live here; I learned that most of the winery employees live in Mendoza or in Chacras de Coria, driving or taking the one public bus that passes through here each day. I enjoyed exploring the grounds of Belasco de Baquedano on my own, as it was quiet and gave me a moment to process the fact that I was living yet another of my travel dreams. 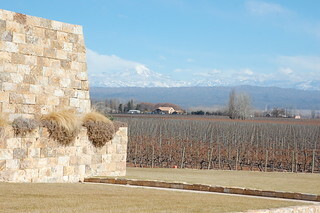 The winery is a relative newcomer to the scene and has a modern approach to winemaking, using high tech machines and techniques. However, it too tries to conjure up a sense of history, and its name reflects its Spanish (from Spain) heritage, including the traditional spelling of Belasco, which is usually written as Velasco in Latin America. 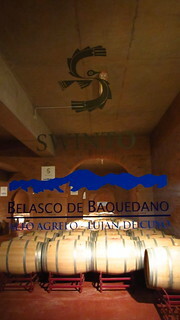 I had scheduled a tour at Belasco de Baquedano based on the recommendation of a guide in Chacras de Coria; he told me that they had an aroma room, which was a great way to learn more about the different notes an experienced taster could distinguish in fine wines. After having learned so much about tasting at Bodega Catena Zapata, I really appreciated the chance to learn more about the flavors and scents in wine. As it turned out, I was the only person on my tour, so I had a private guide through the winery and aroma room. She seemed a little surprised that I wanted the tour in Spanish, but said that a lot of foreigners find it fun to practice their Spanish. I just thought I would learn more that way. 😉 Like Bodega Catena Zapata, Belasco de Baquedano offers several different brands of wine at various price points. After finishing my tour, it was time for the tasting at the attractive wooden bar. At this moment, a Brazilian woman showed up with her son, insisting that she had scheduled a tour for this late hour. My guide decided to take her on a whirlwind tour, and left her colleague in charge of my tasting. This ended up being another blessing, as this woman was very friendly and showed me some aroma cards that I could use to try to pick out the flavors in each of the vintages. My wine education continued and I feel like my ability to distinguish flavors in wine really improved as a result of this practice. 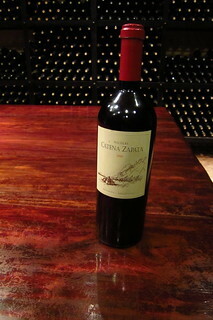 As I wrapped up my tasting, the original guide returned and I asked her for advice on how to get back to Mendoza. Originally, I was going to call another taxi to take me back to the city center, but they informed me that a local bus would pass by in the next half hour or so. If it didn’t, one of them would give me a ride back to Chacras de Coria or Mendoza. I decided to wander out to the main road, Cobos, to try my luck at the local bus. 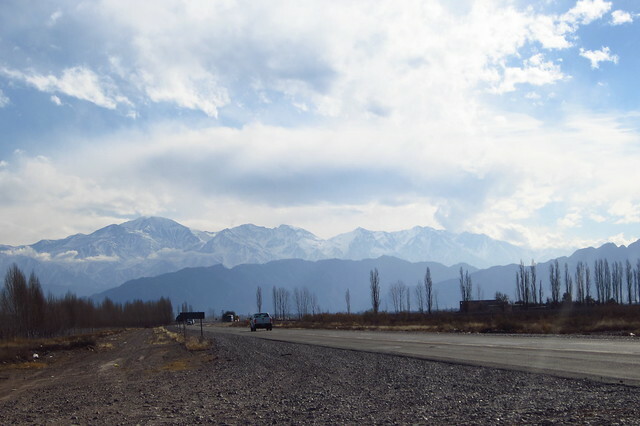 As I was walking down the long gravel driveway, the Brazilian woman passed me in her rental car and asked me if I wanted a ride back to Mendoza. Saved by Brazilians twice in one day! As it turned out, her English was stronger than her Spanish (and than my Portuguese), so we chatted about her work in Brazil and her visit to Mendoza for her husband’s work. I tried to speak with her son in Portuguese a little bit, too. 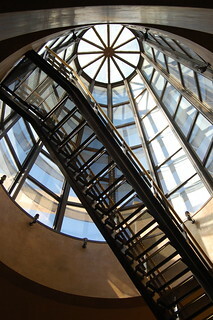 She dropped me off right at Plaza Italia, as they were staying at one of the top hotels in Mendoza. You absolutely can visit Luján de Cuyo independently, but you need to ask around until you find someone who can tell you how to get there. Your best best is to ask the locals who work in the wineries as they know more about getting around the wineries than the average mendocino. There is a local bus that runs down Cobos, which is the road where many of the top winemakers are located, once in the morning, and once in the afternoon, but I couldn’t find anyone who knew its schedule. There are many local buses that go to the Luján de Cuyo region from the city of Mendoza, but you want the one that stops near the main terminal in the center of Luján de Cuyo, where the buses are serviced. From there, you should be able to find a taxi to take you out to the Cobos street. Depending on your budget, you may want to consider negotiating with a taxi driver to take you around for the day, rent a car, or take a personalized tour arranged through a local agency. 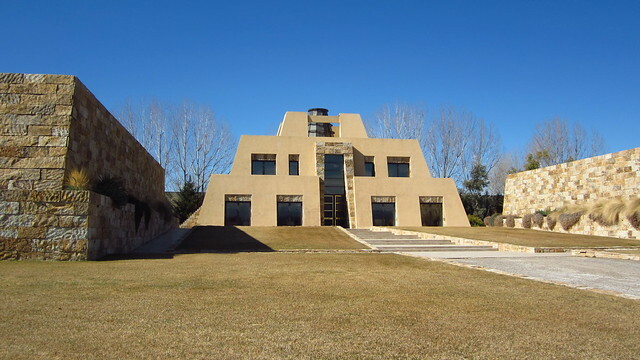 I highly recommend visiting Bodega Catena Zapata, especially if you’re already a fan of their wines from trying them back home. 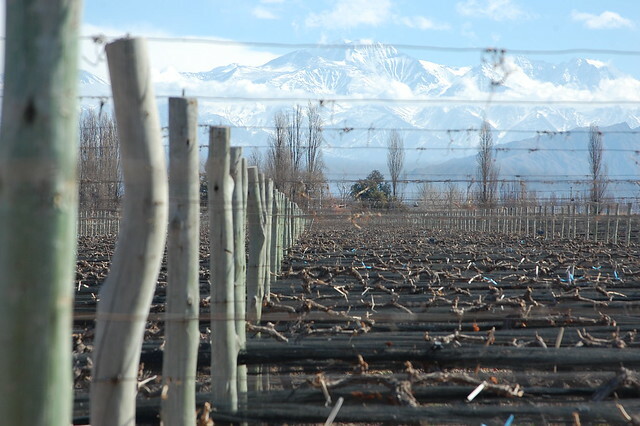 The premium tasting was $100 Argentine pesos in August 2013 but was worth every penny. You can tell that the guides working at this winery are the best of the best. The scenery is also gorgeous. Belasco de Baquedano is located on the same road as Bodgeta Catena Zapata and has a fine dining restaurant and an aroma room. While I enjoyed their wines, I think their real draw is the unique experience they offer. 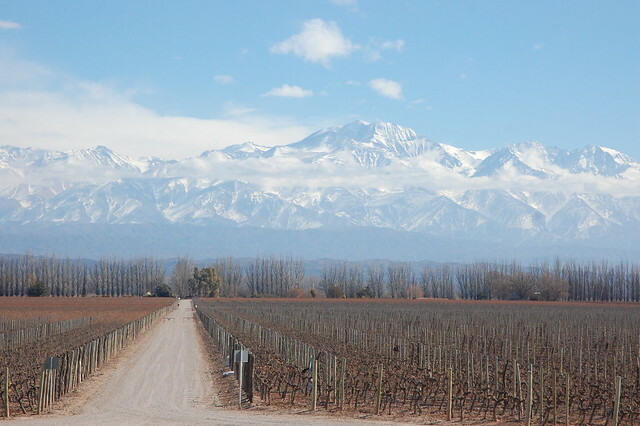 Their tour and tasting was $69 Argentine pesos in August 2013. Personally, I think visiting two high caliber wineries was enough for one day. I scheduled one for 11AM and another for 2PM and I was able to enjoy both tastings at a very relaxed pace. Here are some very useful maps of the Luján de Cuyo region, including a detailed map and list of all of the winemakers in the region (the map at the top of the page – here’s a link to the PDF download). Just as an FYI, you can take the 1-19 bus from the from the west side of the Mendoza bus terminal which costs like 5 pesos and drives down San Martin in Lujan. It will drip you off at one of several stops, many winieries of which like Carmello Patti, Liugi Bosca, Largarde, Alta Vista, etc. are within easy walking distance from here. I believe you can get to Catenza Zapata this way as well, but I’m not sure how far south the 19 bus goes. Hi Rob! Thank you so much for this information, both for my future reference and anyone who may need it. I’m not sure that’s the bus that goes to Catena, but it’s helpful to know where you can catch the bus! Thanks again!